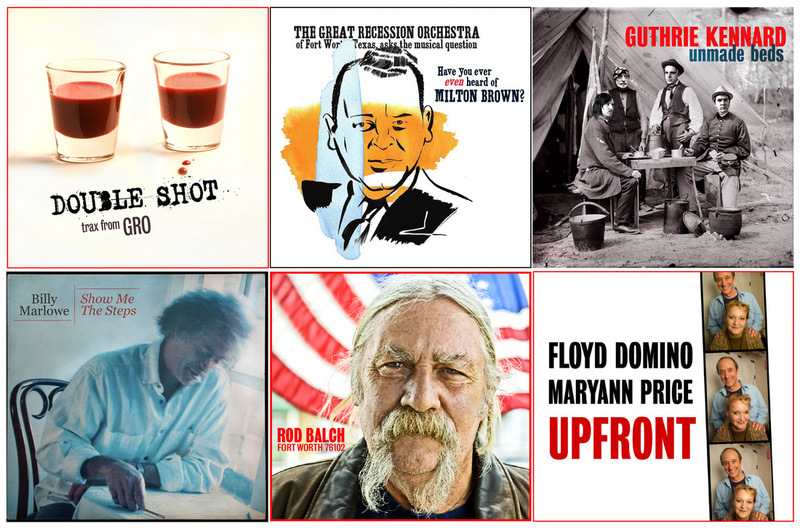 CLIC on this audio button to hear the recent and lightly edited radio interview that Floyd & Maryann gave to Austin's own ﻿TED BRANSON﻿ on UNDER THE X IN TEXAS on ﻿﻿KOOP 91.7 FM﻿﻿ on April 22, 2014. 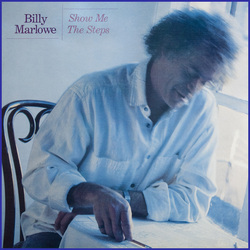 OUR BILLY MARLOWE CD WAS #2 ON THE EUROAMERICANA CHART ON NEW YEAR'S DAY 2013! Bert van der Wijst in The Netherlands. 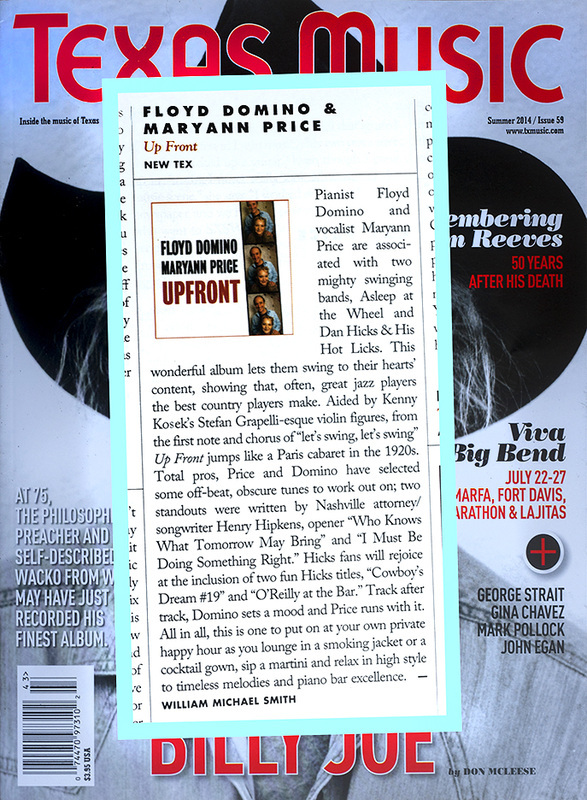 Here's a special thank-you to Fritz Homans in Maine for featuring Billy Marlowe (and NewTex) on his radio show. the time to feature Billy Marlowe, too. It means a lot to see some Texas folks lending a hand. FOR A HANDFUL OF US who lived on the Lower East Side of NYC during the 1980s, Billy Marlowe seemed to capture the spirit of the lives we were living. He was a dreamer, and we were dreamers. He was a poet, and we liked poetry. He was a worker, and we all worked hard. We were cynical and skeptical New Yorkers, but Billy’s passion was strong enough to chip away at our hearts, hearts that were as tough as city sidewalks. It was easy to love his spirit. He intrigued us. Just walking along beside him on Avenue A always made me feel richer. Gary Bristol﻿ and many others. Billy was always blown away---reduced to tears---every time a new player added a fresh note that was just right, or when they contributed a sound that embodied a haunting musical idea that Billy might have heard before, but only in his dreams. who had swiped Louise while he slept soundly in some dark corner. And he wrote songs, and he kept writing songs. Great songs. He passed away more than fifteen years ago. WE HOPE YOU TAKE THE TIME to absorb these magical (and never really released) tracks that were made just blocks away from CBGB’s and The Lone Star Cafe during the crazy days when The Ramones were sedated and Bruce Springsteen was on fire. Our original analogue 8-track tapes that were mastered by Bill Kipper at Masterdisk, NYC, have been carefully transferred to digital by the mastering engineers at Disc Makers. They sound great. For more information, e-mail us, or contact ﻿﻿﻿Steve Satterwhite﻿﻿ at 972-213-6767﻿. online at iTunes, Amazon, Spotify, Soundcloud, CD Baby and just about everywhere. 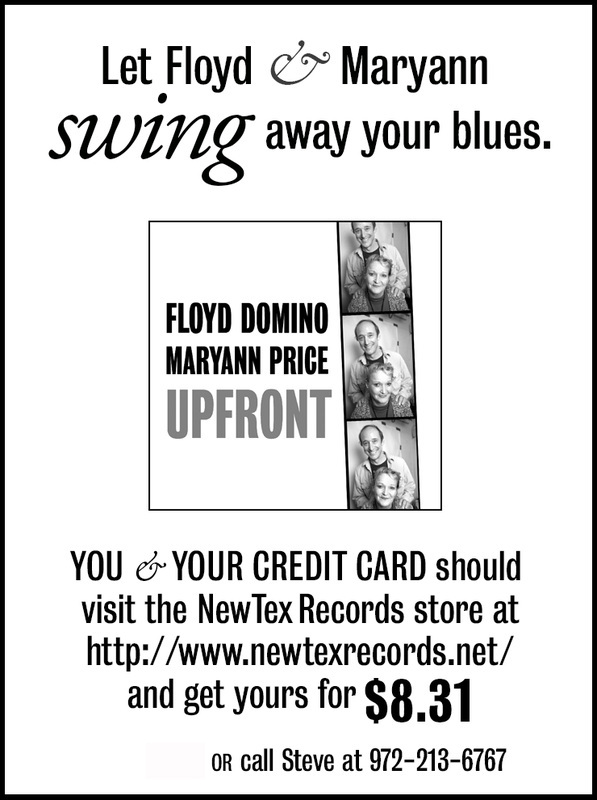 These CD's are also available directly from NewTex for $11.99 including postage and handling. The new video below is a new presentation of GRO video snapshots taken during recent concerts. These bits of concert footage have been superimposed over a studio audio track from our first CD. The pianist on the studio track is the late Mike Hamilton, and all of our GRO efforts are dedicated to him. Please watch this footage on YouTube in HD if you have "the right connection." is our first song at the first GRO gig at ﻿The Western Kountry Klub﻿. This was the first time the band played in public, except for a brief warm-up gig at ﻿The Stagecoach Ballroom﻿ in Fort Worth almost two years earlier. Bubba sang since Damon was in Nashville, and neither of our fine piano players was on hand. Warren Bubba Stephens, Ray Austin, J.D. Smith and Maryann Price played eight songs live on KNON on August 21, 2012.
of good stories about western swing and their careers in Texas music. 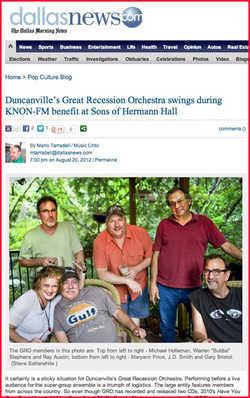 Nice Article on the Sons of Hermann Hall gig! Thanks to ﻿Mario Tarradell﻿ and THE DALLAS MORNING NEWS. CLIC ON THE AUDIO BUTTON BELOW to hear JD's radio spot for the KNON Hermann Hall show. CLIC ON THE AUDIO BUTTON BELOW to hear Renegade DJ Obie Obermark interview Steve in June. This is edited down from a two-hour show (hope I didn't butcher the flow), but it's fun, hearing us yak about GRO and the history of western swing. Obie's great show is called TEXAS COOKING---and it cooks! 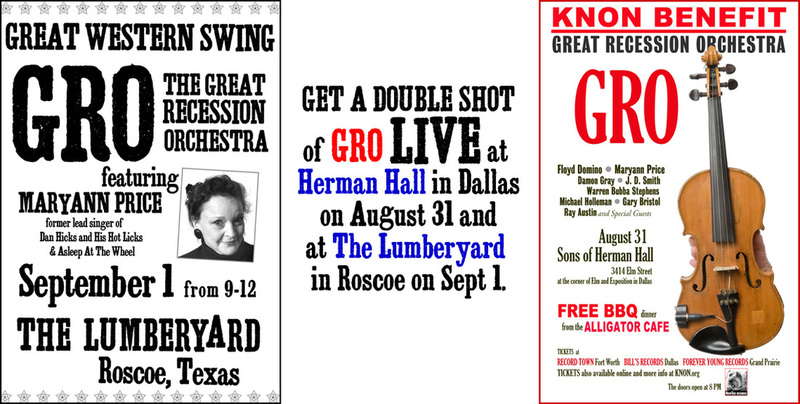 GRO will be doing a show at Herman Hall in Dallas on August 31 to benefit 89.3 KNON, the #1 radio station in Dallas..
CLIC here to hear TED BRANSON interview Floyd, Maryann and Steve on KOOP 91.7 FM. Ted's Austin radio show is called UNDER THE X IN TEXAS. This interview is edited from a 2-hour show. And Ted, I hope I didn't ruin the flow of the show. THANKS. HAVE YOU EVER EVEN HEARD OF GRO? 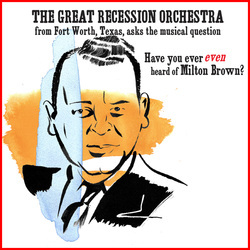 HAVE YOU EVER EVEN HEARD OF MILTON BROWN? 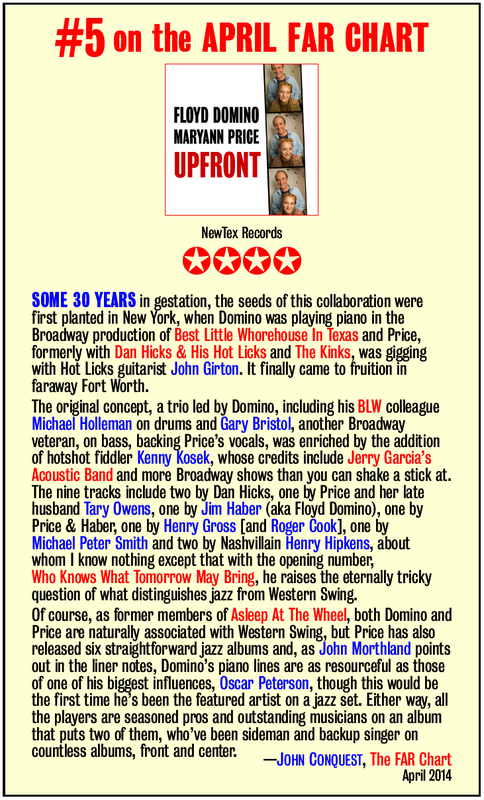 was the first CD by GRO, released in October 2010.
for NewTex Records at Quanah Recording Service DFW. YOU SHOULD HAVE HEARD OF GUTHRIE! 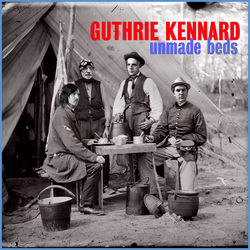 ﻿UNMADE BEDS﻿ is a CD made in 2009 by Guthrie Kennard. 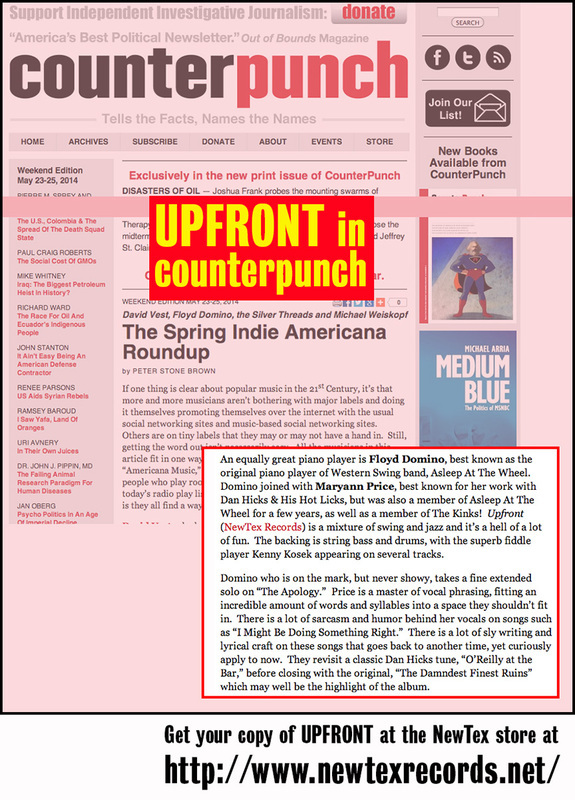 Guthrie was recently featured on Troubadour TX. YOU WILL BE GLAD YOU HEARD OF BILLY. ﻿BILLY MARLOWE﻿ was the first NewTex Recording artist. at the NewTex Recording Studio on ﻿East 4th Street in NYC﻿ in the mid-1980's. They were recorded on our one-inch 8-track Scully.